IPL 2019: Known for his simplicity and modesty, former Indian skipper MS Dhoni knows just how to win hearts on and off the field. IPL 2019: Defending champions Chennai may have lost the match at Wankhede by 37 runs, but that did not dampen skipper MS Dhoni‘s mod. 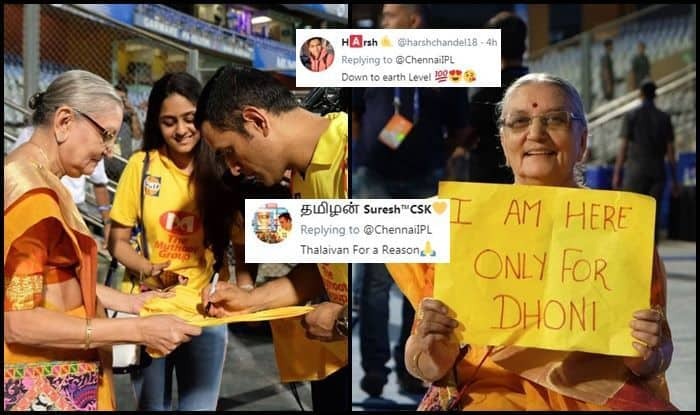 Dhoni made an effort to go down to the stands to meet an old lady, who apparently is a massive fan of the CSK skipper. His gesture for the fan where he obliges her to a selfie and then hugs her is winning the internet. This is not the first time Dhoni has done something for a fan. The 37-year-old enjoys a massive fan following which is evident at every venue he plays in. Meanwhile, after winning three consecutive matches in a row, Chennai Super Kings’ (CSK) winning momentum was halted by the Rohit Sharma-led Mumbai Indians (MI) following a 37-run defeat at the Wankhede Stadium in Mumbai. CSK Skipper MS Dhoni has said that the game did not pan out as planned for his side. “I think quite a few things went wrong for us. We started well, were right on the mark for the first 10-12 overs. Then, a few catches were dropped, a few misfields, the death overs bowling wasn’t great. We don’t have bowlers who hit the deck, it was slightly tough on them,” said CSK skipper MS Dhoni after the match.